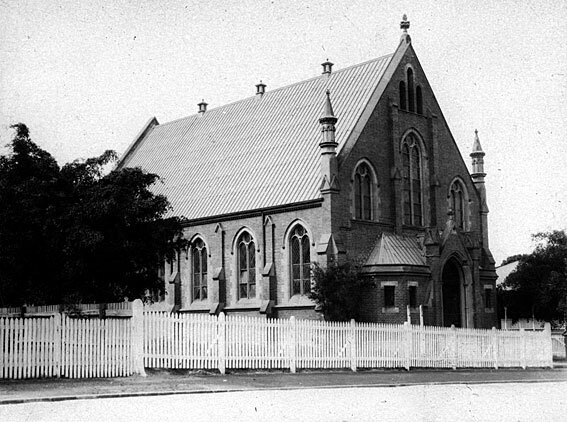 Wesley Church at Kangaroo Point was opened in November 1903. 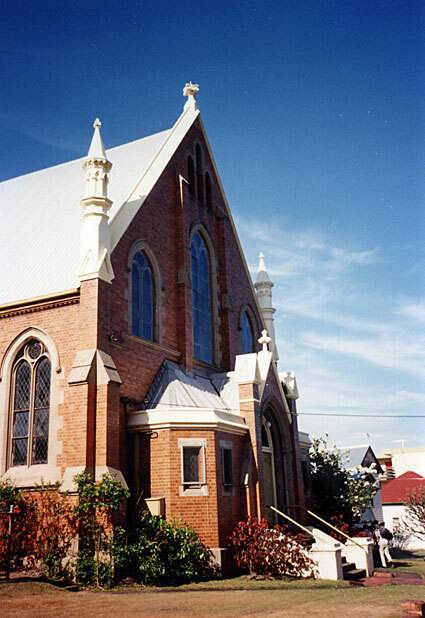 The building was designed in Gothic style by the architect, Henry W. Atkinson, and is constructed in red brick with cement dressings. 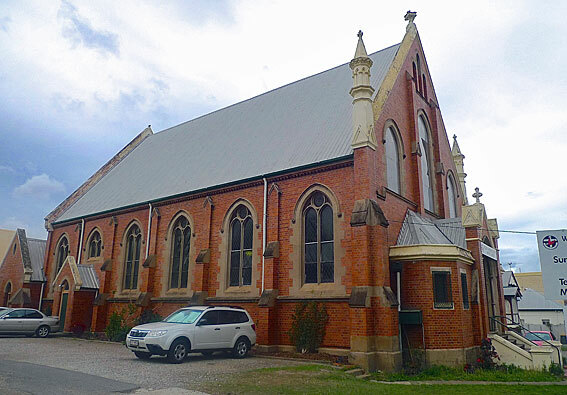 The official opening of the new organ of the Wesley Church, Linton-street, Kangaroo Point, took place last evening when a very enjoyable recital was given. The instrument, built by Mr Whitehouse has already been described in these columns and it is therefore not necessary to refer to the details of its construction. It may be said, however, that the builder has every reason to be satisfied with his work. 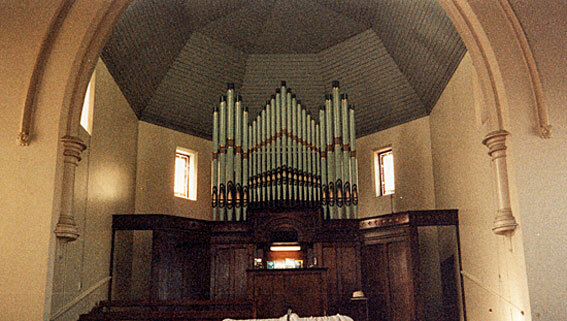 The organ is very favourably positioned high in the apse of the church, and the horizontal swell shutters open upwards to project the sound into the building. 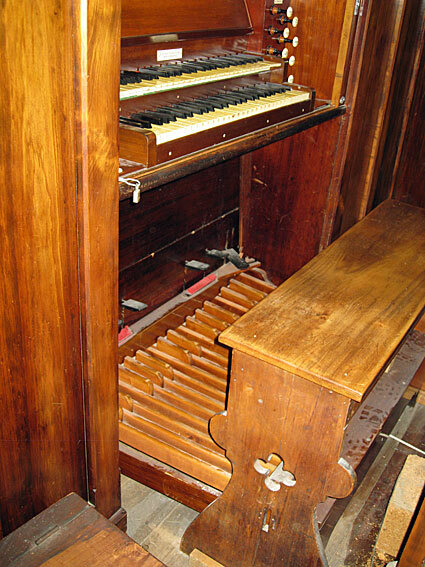 On both this organ and the Whitehouse organ at All Hallows' Convent, Brisbane, the Great and Swell share a common chest.7 In common with other Whitehouse organs of the period, the pipework is by A. Palmer & Son of London and the console fittings by Thomas Harrison of London.8 The showpipes have 'bay-leaf' mouths, as distinct from the 'French' mouths found on the earlier Whitehouse organ at the Congregational Church, Wharf Street. There is evidence that the Swell box was extended at some stage.9 This was presumably to accommodate the addition of the Salicional and Voix Celeste, which were not included in the original scheme of 1903. The date for these additions was almost certainly before 1922, when the firm's ledger records begin. 1 The Brisbane Courier (23 November 1903), p. 3. 2 R. S. C. Dingle, Annals of Achievement: A Review of Queensland Methodism, 1847-1947 (Brisbane: Queensland Book Depot, 1947), p. 223. 3 The Brisbane Courier (10 November 1903), p. 3. 4 The Brisbane Courier (23 November 1903), p. 3. 5 The Brisbane Courier (10 December 1903), p. 4; The Brisbane Courier (12 December 1903), p. 7. 6 The Brisbane Courier (15 December 1903), p. 3. 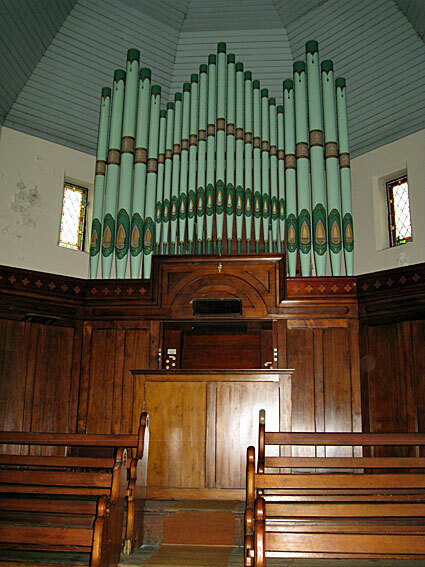 7 Simon Pierce, 'The Organ at Wesley Uniting Church, Kangaroo Point, Brisbane,' Organ Society of Queensland Newsletter, vol. 17, no. 6 (June 1990), pp. 5-10. 8 Personal communication to G. Cox from W.J. Simon Pierce, October 1989. 9 Simon Pierce, op. cit., p. 5. 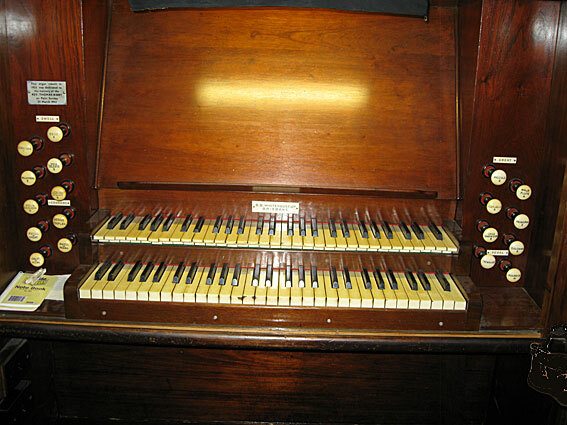 10 Whitehouse Bros Ledger (1940-1954), p. 450; Plaque on the organ. 11 Simon Pierce, op. cit. 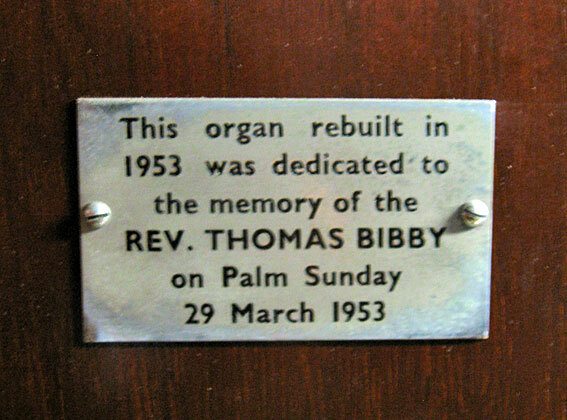 ; see also: Organ Society of Queensland Newsletter, vol. 15, no. 4 (February 1988), p. 33; vol. 15, no 5 (April 1988), p. 41; vol. 16, no. 1 (August 1988), p. 35; & vol. 16, no. 5 (April 1989), p. 49. 12 Specification noted by G. Cox, 1972 and 2014.